My today's recipe is a simple Carrot Rice.It is a quick and easy dish which will be ready in few minutes . Perfect to pack for Lunch. Usually in the mornings I will be multi tasking from cooking lunch, preparing breakfast, getting kids ready to school and so on. There are certain days where I will be hardly left with time to cook anything elaborate, such days I cook something simple like this Carrot Rice. Quick and Easy Rice made with grated carrots and lemon juice. Perfect for packing lunch. It is Vegan. Green Chillies : 2 - 3 nos. Heat oil in a skillet, add mustard seeds and when they crack, add kadala paruppu and raw peanuts and roast for a minute or two. Then add the green chillies and onions and saute till onions turn translucent. Then add grated ginger, mix well and add the grated carrots, Turmeric Powder, required salt (just right enough for Carrots), mix well, cover the skillet and let it cook till the carrots are done. Then add lemon juice to it and turn off the heat. Then add the cooked rice to this carrot mixture along with remaining salt as per your taste (for rice) and mix well. Finally, garnish with Cilantro. Adjust green chillies, as per personal heat tolerance level. If you do not prefer peanuts, you can skip them. That looks like a complete meal in itself.I like your idea of putting grated carrots in it. I usually make it sweet this way. Haha,I loved the small lovely read there Divya.And I loved the recipe so much.perfect for my carrot loving daughter.Thanks. Comfort One pot meal ! 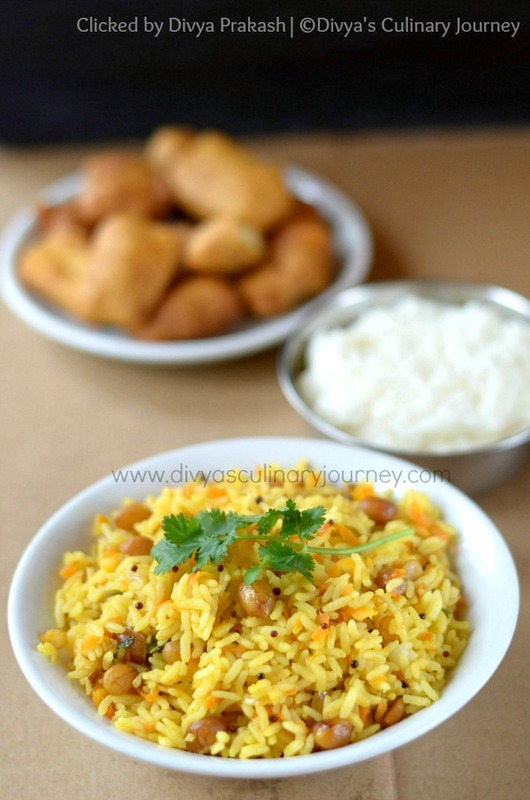 love the rice preparation... great clicks too! simple n healthy lunch box meal!! 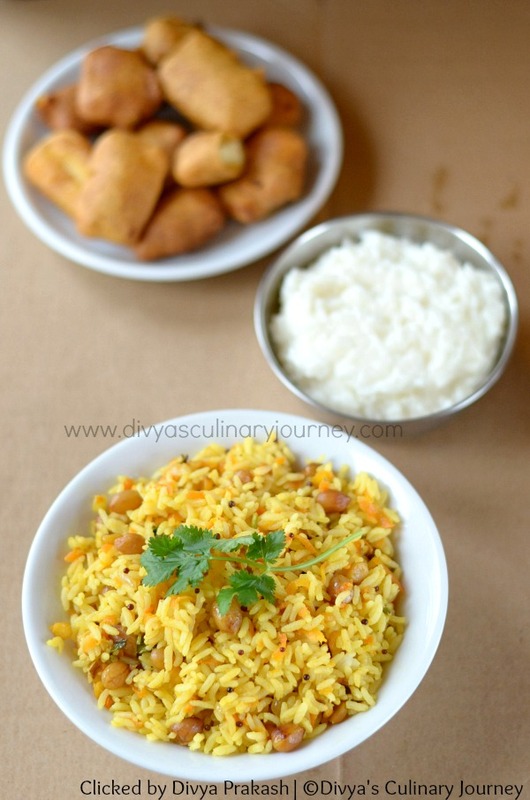 Rice looks good, one of my favorites..
Simple,quick,healthy and prefect lunch box dish. 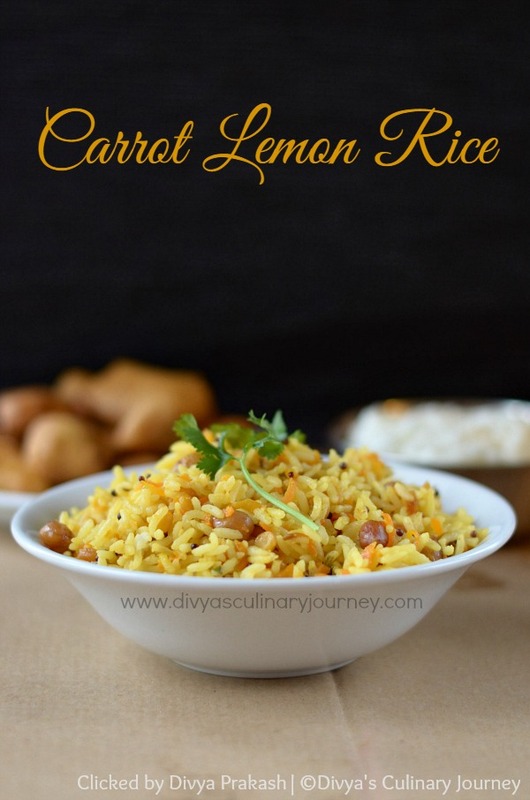 Delicious carrot rice Divya. I love these simple homely food. 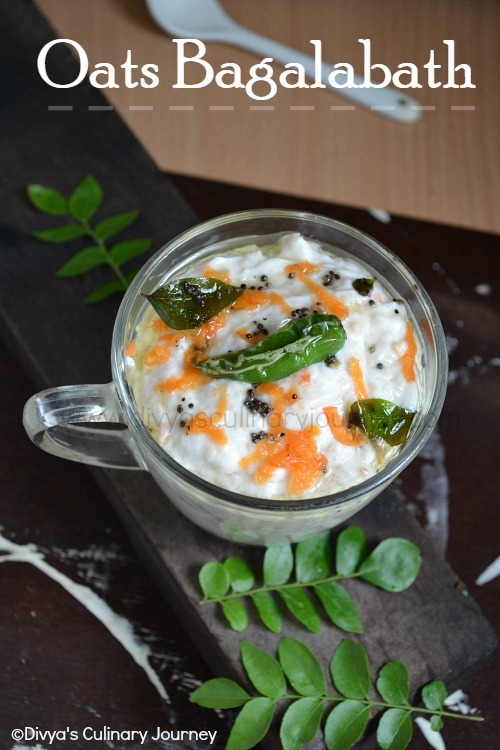 healthy & delicious recipe...my fav too.